Django in Rome 4 CD set!! 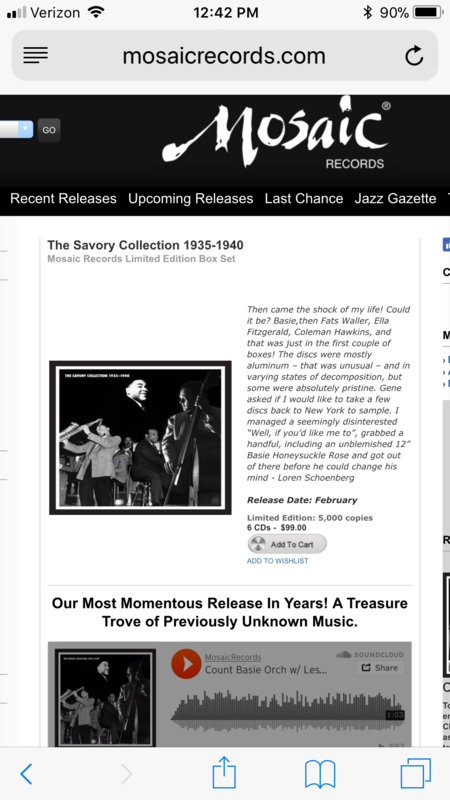 Don’t know if this contains the Ellington/Reinhardt tracks, but a stellar set nonetheless. Just talking with Buco about this last month. It'd be great if it did have the Django stuff on it. Not sure how the lawyers managed to get around the permissions but it is a blessing to have these "lost" recordings. Of course there is no Django as the first (box) goes from 1935 to 1940 and Django was there in 1946. I see that the 3rd set/box is available on iTunes now. Does anyone know if the box 1/2/3 that's on iTunes equals CD 1/2/3? If so it's possible that Django/Ellington recordings will see the light of day. What's amazing about these recordings is that you truly get a glimpse into real life musical situations of these jazzman. They are unrestricted timewise from the vinyl record format. What they played during recording sessions always had to be condensed to fit the format. So they didn't have the freedom to express how they might've wanted to develop the theme of their improvisations. They had this sort of chip on the shoulder that said they had to be done in one or two choruses. And we never until now were able to hear the whole thing. I read in one of the Django bio books that during some bar gig he took 16 choruses improvising. And the crowd was going nuts because each chorus was getting better and better. Now on Savory sets you get to experience what was it like to hear them live and unleashed. There's a close to 10 minutes blues jam on the first set, Lionel Hampton Jam Session. It was an incredible sense of being transported in time when I first heard it. Happy to see a CD release, since I can't abide iTunes. The price isn't even outrageous, considering the quality of Mosaic packages.